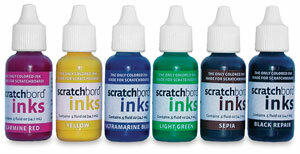 Introducing the first ink formulated specifically for scratchboard. Like other inks they are permanent and transparent, but they don't leave a residue on black scratchboard. Colors are non-staining so that you can re-cut highlights and whites! 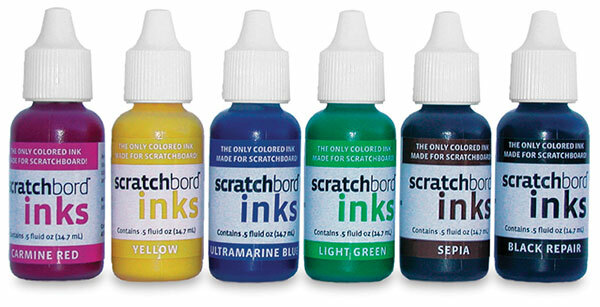 This set provides six ½ oz (15 ml) bottles, including Sepia, Ultramarine Blue, Carmine Red, Yellow, Green, and Black for corrections. A color mixing chart is also included. ™ Ampersand is a trademark.Claybord is a registered trademark of Ampersand Art Supply.